Libraries these days are built digital brick by digital brick – brick being the metaphor for digital books, journals, articles, objects, media, digital infrastructure, networks, apps, data, and analytics. The growth of print collections has been declining considerably in recent times. 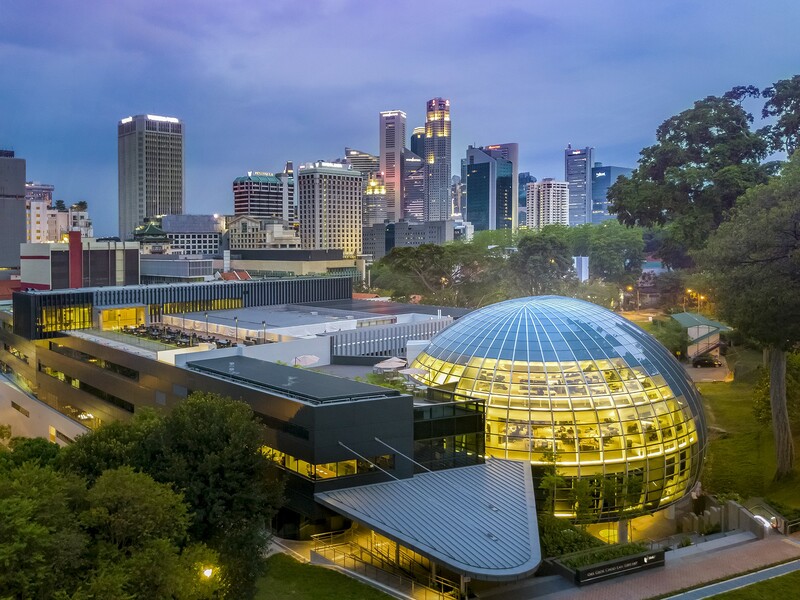 Singapore Management University (SMU) Libraries spends over 90% of its funds on digital collections, 80% of its collections are digital. the digital infrastructure, gateways, discovery layers, authentication systems, analysis of library space occupancy using WiFi heatmaps, big data, data analytics, metadata, DRMs (Digital Rights Management), connectivity, streaming videos, apps, e-learn programs about plagiarism, citation management, bibliometrics, open access repositories for publications, open education resources, games for teaching scholarly communication, creation and management of data, photographs and heritage collections, reading list and copyright management systems, virtual document delivery networks amongst the world’s libraries, gateways to other libraries’ collections, virtual chat services and so on. Libraries of today are not concerned with building large print collections and creating the ‘perfect’ catalogue record anymore. Today’s libraries are focused on community engagement, being relevant, being responsive, being pro-active, making their resources and services ubiquitous, accessible, self-discoverable without obstacles, layers and mediation. They are concerned about being aligned to their constituencies and their stakeholders’ priorities including those of their parent institutions and their target audiences. Today’s libraries recognize that they can never provide all the resources their communities want and need on-site, but they must have intuitive and ubiquitous systems in place to make the resources available and accessible ‘just’-in-time’ and ‘just-for-you’ (their communities) and not ‘just-in-case’. Libraries of today have higher order capabilities to re-invent, re-purpose, re-align and re-engineer themselves quickly and flexibly, both physically and virtually using both the heart and the head, to collaborate with their communities. Libraries do not claim to be the ‘heart of the university’ anymore, but they know they need to be in the ecosystem of their universities and an integral part of their universities’ digital infrastructure, digital services for research, teaching and learning and their nervous systems which include both the heart and the head. Librarians of today are not and should not be defensive about their changing roles and responsibilities. Statements like ‘who uses libraries anymore?’, ‘I never go to the library, I have everything I want’, ‘does anybody use libraries anymore?’, ‘you must have a lot of books’, ‘you must read a lot of books!’ and so on should not trigger defensive reactions. On the contrary, these are wonderful occasions for librarians to demonstrate the value they add to their parent institutions, stakeholders’ and communities’ success and competitive advantage. SMU Libraries’ physical usage has been increasing every year. Over 1.3 million entries (7,000-8,000 unique persons per month) were recorded in 2017, which is a very high number for a university with a population of only 9,000 students. E-book downloads were nearly one million just for 2017. SMU faculty and students downloaded half a million articles in 2017. SMU librarians helped 500 students and faculty with their research enquiries, involving high end financial, legal, economic, business and other information resources. Here is a selection of qualifications and expertise SMU Librarians have: Six with business degrees, seven with engineering degrees, three with law degrees, one with accountancy, four economics, one with biological sciences (including psychology), four computer science and three with humanities degrees. They all have master’s degrees in library and information science from well- known universities, local and international. Some have a second master’s degree. They don’t shelve books, neither do they catalogue books; they analyse data, use high end tools and resources to provide services, to plan, to make decisions and to engage with their communities. They provide consultancy to faculty and students and manage digital infrastructures. They teach students and guide faculty how to find, access and make the most of relevant resources efficiently and effectively. They negotiate licences for databases with vendors and provide copyright advice. They organize metadata and ensure resources are accessible in a seamless way just-in-time. SMU librarians research, write, publish and present papers at international conferences and some co-author research papers with faculty. Libraries of today are all about expertise, resources, services and spaces both digital and physical. They add value to their communities’ success in a seamless, ubiquitous and agile way. Libraries of today are the digital and virtual village squares of their campuses. Today’s libraries are about engagement, collaboration, communication and partnerships.